I am running queries against a polygon layer using the ArcGIS SOAP Web Service. 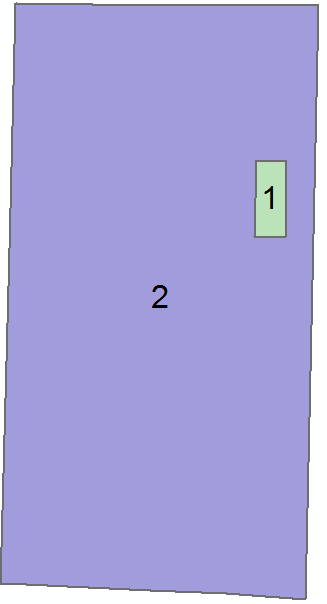 A user selects a point within that layer and the resulting feature set contains PolygonN objects. In this case, I would only want the geometry contained in the purple area, not the green area. When the user selects a point within the purple area, the resulting PolygonN object contains 2 rings, representing the outer and inner areas, as it should. The inner ring, as far as I can tell, has no way to indicate that it is actually negative space. So the resulting polygon looks like it has 2 solid shapes, when in fact it is only one shape with a hole in the center. Does anyone know how I can determine that a polygon's ring is actually negative space? It is common practice to represent islands as counterclockwise rings with exterior rings as clockwise. If you use this formula to calculate area by stepping through the points in each ring, you should see positive area for the exterior ring, but negative area for the interior one. Not the answer you're looking for? Browse other questions tagged arcgis-server polygon soap donut-polygons or ask your own question. How to join attributes of donut polygon to hole polygon in ArcGIS?